Love them or hate them, it looks like photo filters are here to stay. The good news is that they can be subtle: Photos don't have to look like they were taken 45 years ago and left to yellow in some dusty album. 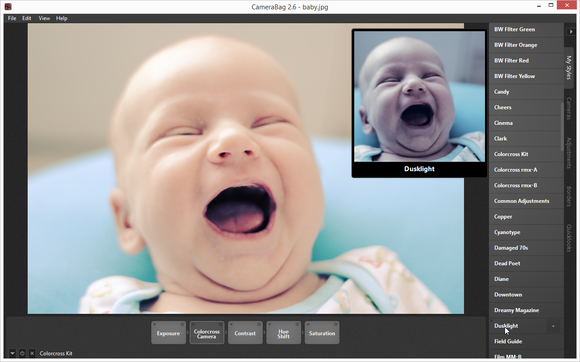 Nevercenter's CameraBag ($20, currently on sale for $15) is a snappy and capable image editor that specializes in applying full-image effects and filters. CameraBag's interface is lean and focused. 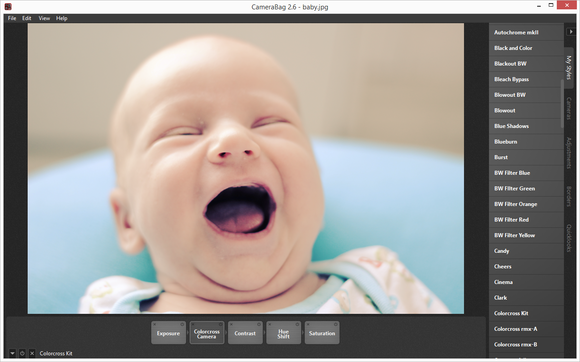 If you find Photoshop intimidating, you'll enjoy CameraBag's straightforward interface. Your image takes up the bulk of the screen, and a vertical toolbar across the right-hand side of the window lets you apply various filters. Filters are stacked on top of your image, meaning you don't have to choose just one. When you apply a filter, its name shows up in a horizontal strip along the bottom of the image. If you're not sure whether or not you like the filter, you can toggle it off and back on easily, without having to hunt for it again in the list of filters. That list is long, with filters spread out across several groups. It starts off with a My Styles group, which has very Instagram-looking filters named for years (1952, 1959) and styles (Cinema, Pinhole). But CameraBag 2 wasn't meant to be a mobile app, so it uses your computer's power: Hover your mouse over a filter, and you'll see an instant preview of what it would look like. It's very fast and quite informative. The instant filter preview makes it easy to find appealing options. The next group of filters, Cameras, features options like Instant Camera, Magazine Camera, and Matte camera. Each filter can be adjusted—you can "remix" the filter to vary its look, and use a slider to simply tone down the effect or make it more pronounced. If you're not into heavy-handed filters (perfectly understandable), you should check out the Adjustments group. Here you'll find the basics: Crop and straighten your photo, adjust exposure and contrast, and tweak your image in other traditional ways. 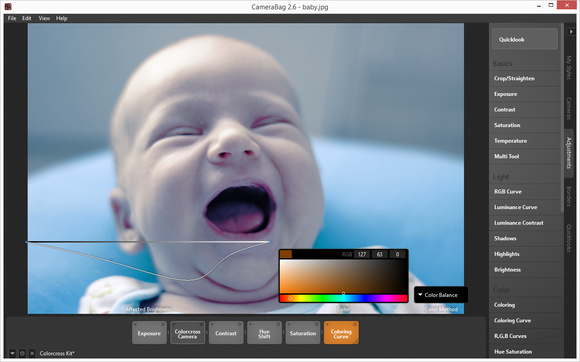 You can control its RGB, luminance, and coloring curves, and generally fine-tune its colors and exposure. 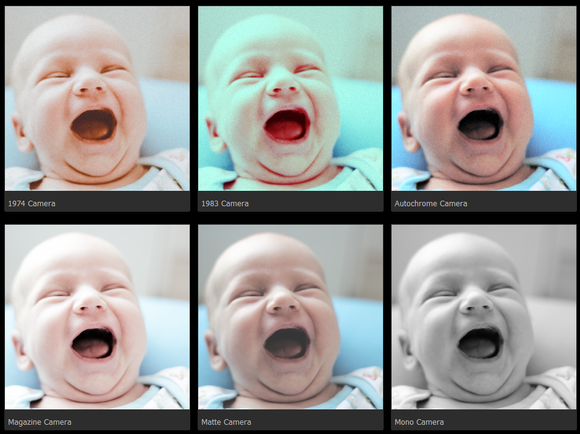 Some of the filters are more subtle than others, letting you adjust color curves. The final group of filters is perhaps the most gimmicky one: Borders. You can make your photo look like it's a frame out of an old film, a slide, and more. Then there's the Quicklooks tab, letting you get a feel for every filter and adjustments CameraBag can make using side-by-side thumbnails. It's very fast, but will only give you an initial idea of what each filter does, since the filters can be adjusted for very different looks. 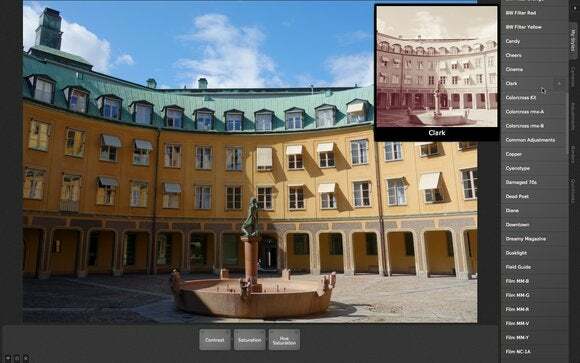 The Quicklooks feature lets you easily tell what each adjustment will make your image look like. Because CameraBag doesn't let you select regions of the image (no lasso or other tools), it lends itself well to keyboard shortcuts. There are shortcuts for flipping back and forth between filters, remixing and tweaking the current filter, applying a random filter, and comparing your processed image with the original. You can do just about anything without having to reach for the mouse—a rare quality for an image editor. You don't have to reach for your mouse. One keyboard shortcut (and feature) that's sorely missing is "open next image." CameraBag makes you manually open each individual image you want to work on—there is no way to quickly browse through all images in a given folder on your disk. This means you'll have to use it in tandem with another image management program: one to view your collection and one to edit your photos. More serious image editors feature non-destructive editing, preserving your original and letting your roll back your changes. CameraBag 2 doesn't offer that level of granularity: Save your changes and it will overwrite your original image. Fortunately, you get a warning before this happens, and it's easy to save the image under another name. You also get to resize it at the same time, which is handy. Three things make CameraBag fun to use: It's quick, it's simple, and the filters look good. Even if some of the defaults are painfully hip and retro, it's easy to tone them down and end up with some truly beautiful photos. Almost every time I reached for CameraBag, my photos looked the better for it at the end of the process—and it didn't take long, either. CameraBag won't replace Photoshop, but it doesn't try to, either. CameraBag 2.6 is a fun way to make your images pop.